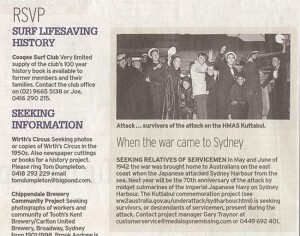 An advertisement for the KUTTABUL COMMEMORATION PROJECT 2012 appeared in the RSVP section, page 23 of The Sydney Morning Herald on Saturday 5th of February, 2011. The snippet calls for the contact details of any relatives/descendants of the crew who were aboard the converted ferry HMAS KUTTABUL on the evening of the 31st May/01st June, 1942 when the vessel was sunk by a torpedo, fired by a Japanese Midget submarine. The story in full, reads as follows:- SEEKING RELATIVES OF SERVICEMEN. In May and June of 1942 the war was brought home to Australians on the east coast when the Japanese attacked Sydney Harbour from the sea. Next year will be the 70th Anniversary of the attack by midget submarines on the Imperial Japanese Navy on Sydney Harbour. The Kuttabul commemoration project (see ww2australia.gov.au/underattack/sydharbour.html) is seeking survivors, or descendants of servicemen, present during the attack. Contact project manager Gary Traynor at customerservice@medalsgonemissing.com or 0449 692 401. IMAGE ABOVE: The snippet from The Sydney Morning Herald which appear in the RSVP section on Saturday 5th February, 2011. Please click on the image to enlarge. As a result of the story, we were successful in making contact with HMAS Kuttabul survivor, Able Seaman Neil Frederick ROBERTS (Service Number S5973) who was onboard the vessel when she was struck by the Japanese torpedo. Also, the family of Stoker 2nd Class Herbert Arthur SMITH (Service Number S6131) who sadly lost his life as a result of this attack. This event is planned to bring attention to the work performed by Legacy Australia in caring for the families of our servicemen and women and will be held on the 1st of June, 2012. Medals Gone Missing Administrator Gary Traynor would like to thank the Sydney Morning Herald and Sydney based web designers, Quantum Web Solutions for their ongoing support in this worthwhile cause. For further reading, please Click Here to view our original post in relation to HMAS Kuttabul. 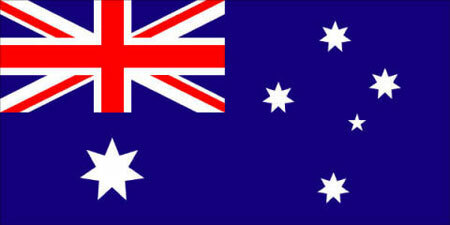 This entry was posted in Honour Roll - Australian Stories, Military Medals and tagged HMAS Kuttabul. Bookmark the permalink.